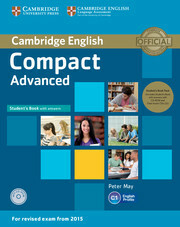 Compact Advanced Student's Book with answers provides C1-level students with thorough preparation and practice needed for exam success. Ten units cover all four exam papers in a step-by-step approach. 'Quick steps' and Writing and Speaking guides, explain what to expect in the exam, and provide strategies on approaching each paper, model answers, useful expressions and further practice. A Grammar Reference covers all key areas of grammar. Two practice tests with audio are online for teachers to access. The CD-ROM provides interactive language and skills practice, and the Class Audio CDs contain the Student's Book listening material.